If you are like me, you have a LinkedIn profile which describes your professional experience and career to date. It's quite a popular forum for professionals and a lot of recruiters use LinkedIn to find candidates. But LinkedIn seems to mostly target white collar workers. This leaves a large hole in the market for blue collar workers - so Facebook is stepping in. 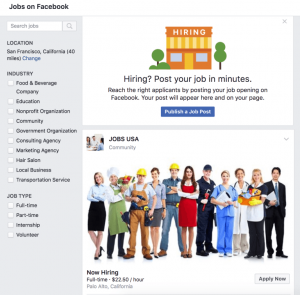 Facebook has launched a Jobs tab on Business pages where businesses can post job openings. These jobs can be promoted by businesses in a Jobs Dashboard, Facebook Marketplace and the News Feed with ads. Jobseekers can search for positions, auto-fill applications with their Facebook profile information, submit their application and communicate via Facebook Messenger to arrange discussion and even interviews. So far, it has only been rolled out in the US and Canada, but Facebook are partnering with recruitment companies to roll out in Brazil, United Kingdom, France, Germany and Italy. It will be interesting to see how this new initiative performs and if Facebook will be able to take some market share off LinkedIn which is a very big income generator for Microsoft (earned $1.1B in Q4 2017). No news about when it will be released and available in Australia, but it could be a very useful tool for businesses who are looking for people who may not be actively using services like LinkedIn or even Seek.com.au.